← Where’s This “3 Months Off” I Hear Good Things About? Math Makeover – Let’s Talk About Skid Marks! Algebra 1 is almost exclusively about mastering linear functions. Let’s get comfortable with moving through the data – graph – function triangle, and look at different forms. We may look at some quadratics at the end of the course, but primarily, Alg 1 = linear functions. In Algebra 2, we are exposed to a bank of functions (rational, radical, quadratic, cubic, exponential) and should be challenged to make decisions. How do these functions behave? How are their transformations similar? Which function is approproate for a given data set? The data set in the problem above can be used to start exploring the differences between linear and non-linear functions. I’m thinking this would be a good opener to an Algebra 2 course, where we begin having discussions about the possibile behavior of data. What’s measurable? What are the variables? Is there anything else you’d like to see / know? 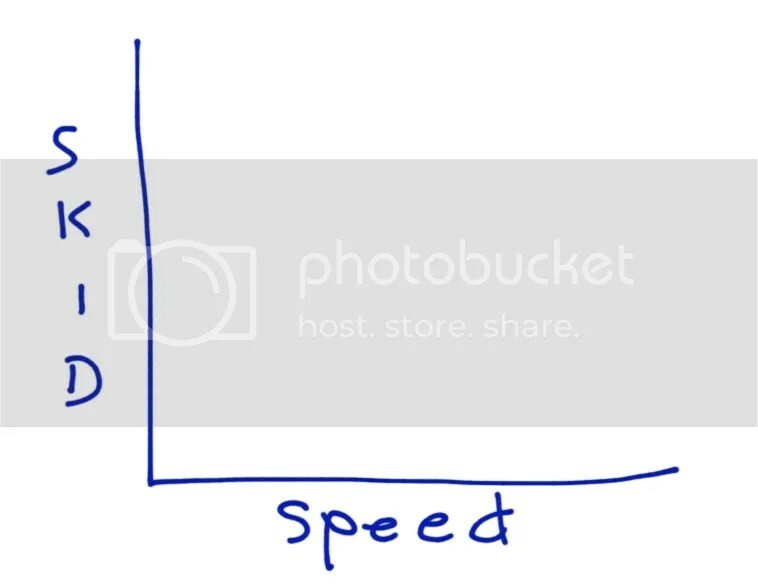 Hoping that students recognize that we would like to see more videos, with different car speeds. We don’t have any data yet, but how do we think the data will behave. Certainly, longer skid marks will be associated with higher speeds, so we can predict a data set would reflect that. 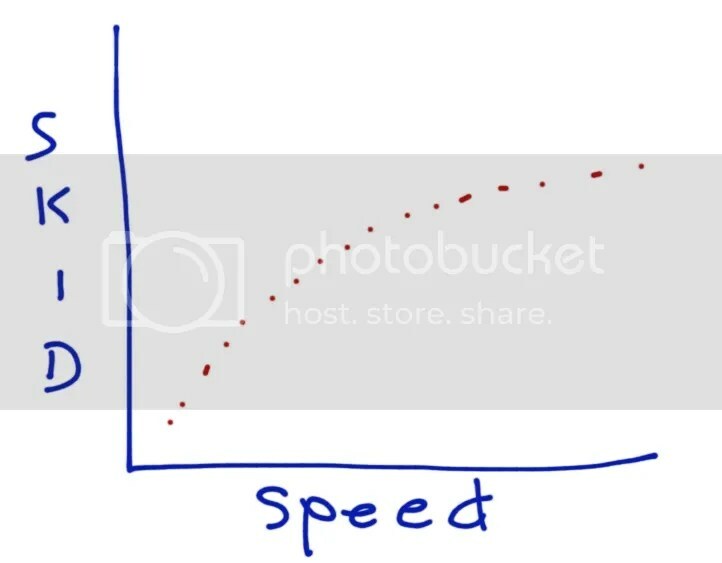 Is it reasonable to expect that speed and skid length will share a linear relationship? In other words, does each additional mph of speed increase the skid mark length by a fixed amount? If not, how else might the relationship be portrayed? Perhaps skid marks stabilize after a certain speed? Is this reasonable? Is there a point where perhaps speed does not matter? 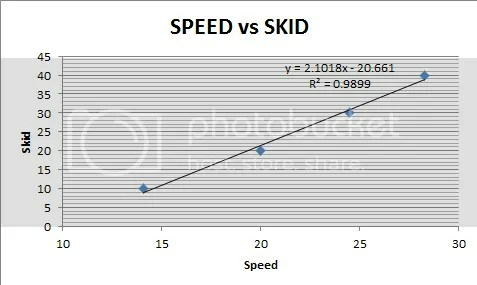 What would this graph imply about the relationship between speed and skid length? 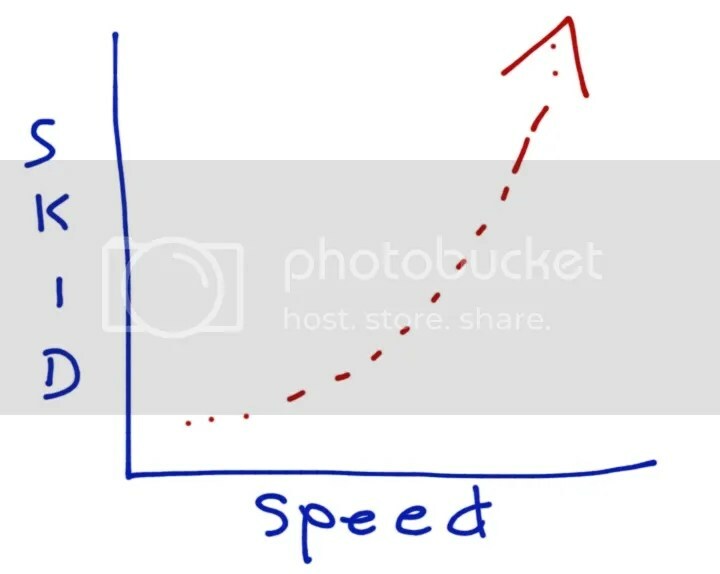 Do we feel that speed will have a bigger influence over skid length, the faster you go? In any case, I want my students to make an argument about the nature of the relationship, and be able to summarize their thoughts, before we start looking at data! Which variable is x, and which is y. As an algebra teacher, does it matter? As a stats teacher as well, it matters a lot. I’m much more comfortable here with making speed x, and mark length y, but the data is clearly formatted in the other direction. I’m sticking with speed an the independent variable. Do I care about the point (0,0)? Is it germane to this discussion? Can we ignore it? There’s probably a domain / range discussion to be had here. Since (0,0) was not an observed value here (in my mind), I am leaving it out and only considering the other 4 points. So, here is the task for my students. 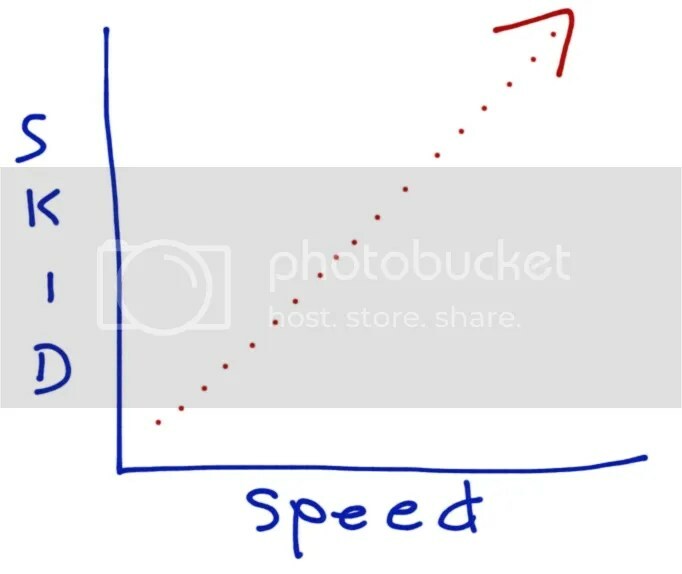 With a group, defend whether the data suggest (or do NOT suggest) a linear relationship between speed and skid length. That’s it. I’m hoping the students will make a poster or some visual, look at a line-of-best-fit, see how well the points fit their line, and defend their ideas. Looks pretty linear, but looking at the slopes between consecutive points reveals that the slope is growing with increased speed. I’m in no rush here to establish the true nature of the relationship. This will be a data set to come back to later in Algebra 2 when we have our tool box of functions more clearly fleshed out. And that nasty radical function? We will come back to it during our radical functions unit, but will attempt to verify its validity, rather than just take it for gospel. 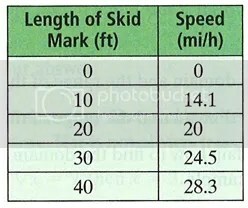 The file below contains some nice information on skid marks, speeds, and the effects of surfaces as well. This entry was posted in Algebra, Statistics and tagged dan meyer, linear function, radicals. Bookmark the permalink. I really like your ideas here. I love how you have students think about whether it is linear or exponential. I teach Algebra II and am planning to have an introduction to square roots with this type of scenario.